To add a new address to send from, you must either have that address forward to your gmail inbox, or have another method of checking the email – perhaps it’s a shared email that goes to someone else’s inbox. This will be important later, when you are asked to enter a confirmation code that was sent to the email you are trying to add. 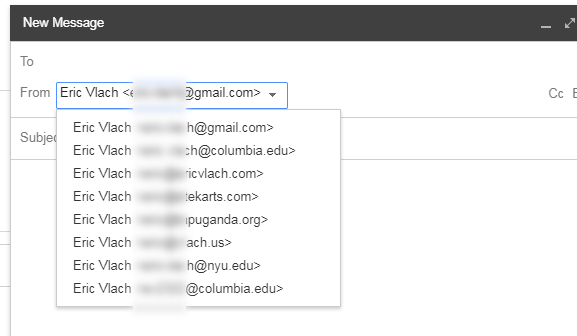 Under the “send mail as” section, click “Add another email address”, and in the next window, enter the name you’d like the address to appear in other people’s inboxes (e.g. your name if a personal address, or a generic name if it’s a shared inbox,) as well as the email address in question. For most cases, I recommend you keep “treat as an alias” checked. Feel free to click the link to learn more about this option. If you are adding an address with a different domain than the account you are logged in as, the next step will ask you to enter SMTP server information. For example, if this is a personal gmail inbox and you are adding a columbia.edu address, it will ask for the connection details – you can reach out to me for help, or enter the lionmail details, which are smtp.gmail.com, port 465, username is your UNI@columbia.edu, and password is your Lionmail Device Password (NOT your UNI password. Click here to create or reset your device password if you don’t know it). Click to add the account. If you are adding an address with the same domain (e.g. you are logged into LionMail and adding another columbia.edu address), simply click “Send Verification“. This will send an email to that address, with a code you can paste in the last window, or a link to click on. You’re done! Go back to your inbox, and click to compose an email – you should now have the new email address as an option to send from.